A few weeks ago I tweeted about how I'm using Airtable in the classroom and got a lot of responses asking for more info. This is my attempt to share how Airtable has been a game changer for me. As a teacher, I organize a lot of data from student test scores to lesson plans for individual days or whole quarters of the school year. While spreadsheet apps like Numbers and Excel are powerful, they primarily work with just text and numbers. Fortunately, thanks to Federico Viticci's list of apps he's trying in 2016, I found Airtable. AirTable is a database app that supports many different data types like pdf and image attachments as well as barcodes. While it may not be perfect, it has become an invaluable tool in my classroom. To begin understanding Airtable and its features you first need to understand its vocabulary. What would be a spreadsheet document or file in Excel is called a "Base" in Airtable1. Different spreadsheets inside of a Base (what would be Sheets in Excel) are called "Tables". 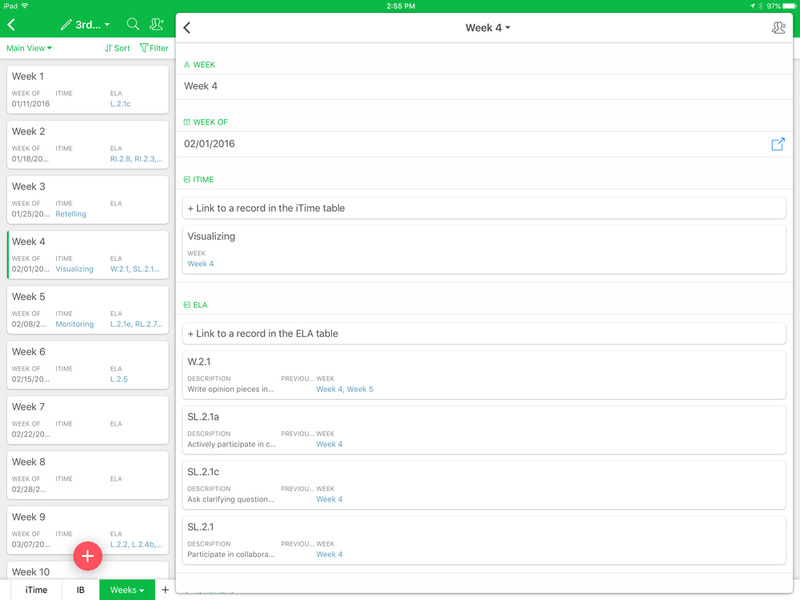 Currently, Airtable is available on iOS and on the web2, and the two versions have very different interfaces. Airtable on the web is essentially a standard spreadsheet with special cell types that can include dates, selections, attachments, and more. 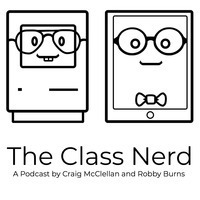 On iOS, each entry is more like a single record in a database than in a typical spreadsheet. This is my favorite way to use the service and what differentiates it for me from a standard spreadsheet. To give you an idea of how these work, I'll share how I set up my 9 week planners in Airtable. Like many schools, our year is divided into 9 week quarters. The end of these quarters serve as a natural break point for planning and curriculum as this is when students receive report cards. For each 9 weeks, my school district gives teachers a Scope and Sequence for each subject to show what Common Core State Standards should be covered in that quarter. How and when the standards are covered is up to the teacher, as long as they are being covered. At the beginning of each quarter, I make a new Base to help me further plan out by week what standards I want to teach. In the base I will create a Table for each subject with an entry for every standard I am required to teach that 9 weeks. Finally, I make a Table with an entry for each week of the 9 weeks and link the standards from the other tables to the week when I want to teach it. As I go to create my lesson and unit plans for a week or individual day, I have a map laid out for me that while being flexible based on student needs, helps me remain on track. While most spreadsheet apps can apply filters to data to make it easier to view, the fact Airtable has different data types makes this even more powerful. 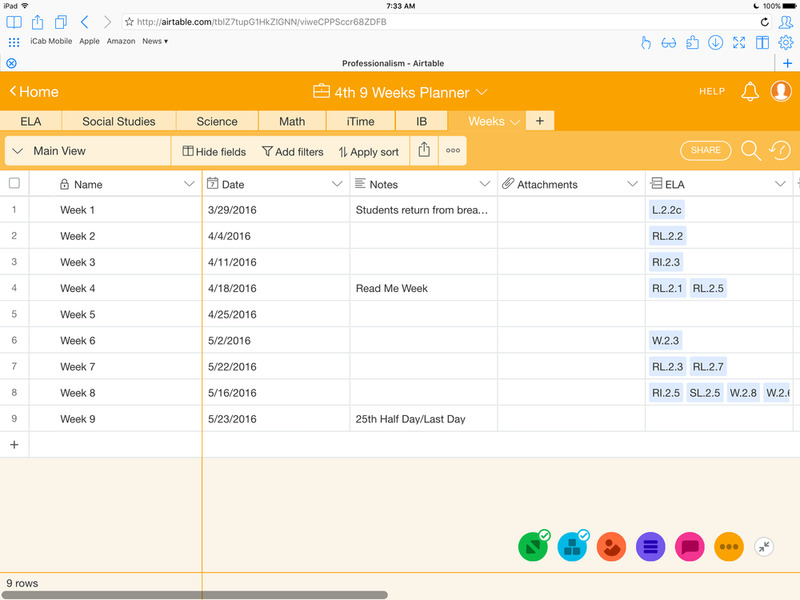 My specific lesson plans are all kept in one Table, and using AirTable's "Multiple Select" data format, I create fields for the day of the week, the week, and the subject. I can then create views to let me see my plans however I need to in order to continue planning or teach from my plans. The following view would allow me to see everything I was teaching on Tuesday of Week 1. This allows me to see only what I need to see at any moment and not get distracted. Being able to share and work on my lesson plans with other teachers is incredibly important, especially as a relatively new teacher. I regularly meet with my school's instructional coach to review plans and look for areas where they could be improved. Moving my plans to AirTable has helped this process greatly. Until AirTable, in the area of cloud based collaboration the top player has been Google with everyone else behind. No one has yet matched the effortless and immediate syncing Google Docs provides. While Microsoft has made strides in this area and there are newer services like Quip entering the field, none have really stood up to Google. Unfortunately for people like me who use iPad as their primary computing device, Google still hasn't updated their apps to support iOS 9's multitasking which renders them almost useless. While AirTable isn't designed as a competitor to the entire suite of Google Apps, if you are someone who needs its other tools, the collaboration tools add to its usefulness. I often sit in a meeting with my instructional coach where both of us edit and review my lessons from our devices simultaneously. Changes then appear immediately on other person's device. In the few months we've been doing this, AirTable has always proven itself fast and reliable making it a great tool for collaborative planning. While AirTable is well made and continues to improve regularly, there are still a few places where it feels like iOS is a second class citizen compared to the web version. This does seem to be an area of focus for the AirTable team as every update brings features I long for (such as the most recent update adding the ability to duplicate bases or tables being in), but there is still room to grow. My primary complaint right now is a lack of iOS Document Picker support for attachments. I like to include PDFs of graphic organizers or anchor charts in my plans, and this is very hard to do on iOS. The web version can access the Document Picker due to Safari's ability to upload files which was added in iOS 9, but the AirTable website redirects to the app when opened on an iOS device. To combat this, I login to the web app using iCab Mobile and its Browser ID function to tell the website I am accessing from a Mac. This allows me to fully use the web interface on iOS. The other option is to post to AirTable using their API and Pythonista. Unfortunately, as a brand new Python programmer this is currently above my skill level, but I'm hoping to use this summer to improve my programming skills to solve this issue. We'll see how successful I am. Another option for adding attachments would be to have a share extension so users could attach a PDF to an AirTable entry straight from PDF Expert. While AirTable's iOS experience is lacking in certain areas, it is refreshing to see developers creating apps that have such a unique experience on iOS and design with a touchscreen in mind. I'm excited to see where this tool goes in the future and how I can continue to use it to help me be more productive in my classroom.